Today’s Extraordinary Women Radio features a delightful interview with M.L. Hanson, who is the founder of the Colorado Women’s Hall of Fame – among so much more that she’s done in her impressive career! M.L. is a pioneering, ground breaking woman who set out to leave a legacy – and wow – did she ever. In the late 1970’s and early 80’s, M.L. Hanson observed that the professional lives of contemporary women were changing. Women wanted to and expected to be treated equally to men in their professional lives. Ah – what a concept – right?! As Assistant Vice President at the United Bank of Denver, M.L. found herself in the role of a trailblazer. She was impressed by the vitality of the women she met and inspired by the pioneering accomplishments of women in Colorado’s history. She began to dream of a platform where great women could be recognized. M.L. shares more about how the story unfolded in the interview – so I won’t spoil it here. But suffice it to say – that M.L. went on to found the Colorado Women’s Hall of Fame in 1985. And since 1985, the Hall has inducted 152 visionary and trailblazing women from the past and present who have a connection to Colorado. The Colorado Women’s Hall of Fame inductees includes: teachers, doctors, scientists, politicians, social activists, bankers, newspaper publishers, philanthropists, aviation pioneers, humanitarians and authors. So many women in the Hall are unsung heroes, “hidden figures” who have endured with superlative strength, beauty and love. They deserve our respect and acknowledgment as shining examples of the potential of all women. Their accomplishments are a strong legacy, as tall as the Rocky Mountains they stand beside… and as broad as the plains they look out upon, and have shaped history and transformed lives. M.L. certainly fits in this group of extraordinary women! Today she shares her journey through her incredible career. We talk about following your dreams, leaving legacies and the importance of bringing women’s stories into our history books! 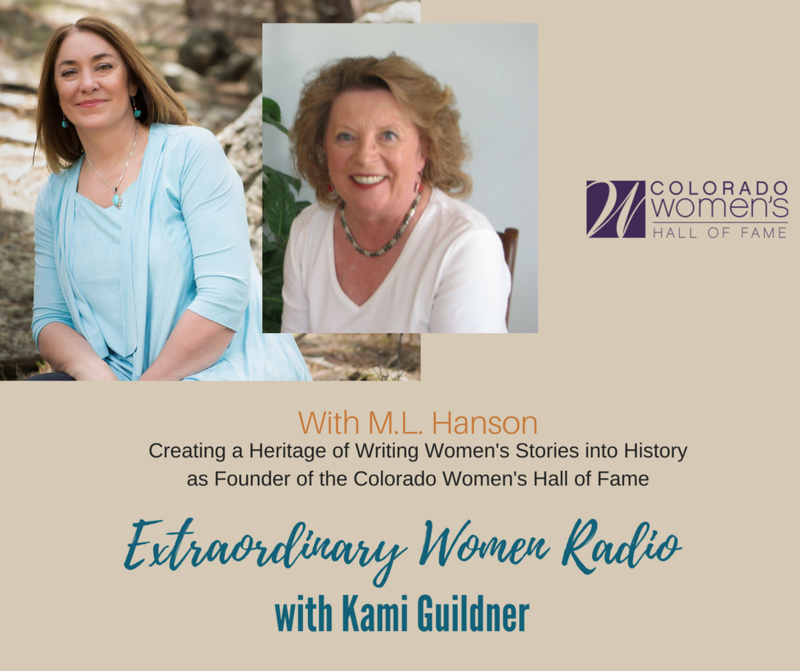 Let’s meet the Colorado Women’s Hall of Fame founder, M. L. Hansen. You can learn more about M.L. on her company web site at www.mlhanson.com. In addition, M.L. is President of Idyll Cravings, LLC a small batch specialty food producer she started with her entrepreneur husband. www.idyllcravings.com.